AT FIRST GLANCE, Meow Wolf and the Lea County Center for the Arts are universes apart. The former is a national-buzz-generating art collective in a neon-tinged, multimillion-dollar headquarters in the art mecca of Santa Fe. The latter is a humble storefront in downtown Hobbs that’s home to a nonprofit, multidisciplinary arts center operated by the Lea County Commission for the Arts. Hobbs, a city of about 34,000, in the state’s southeast corner, is best known for oil and gas production, not harboring world-class contemporary arts. Like Meow Wolf, the Lea County Center has pushed far beyond its community’s expectations. “Andrew is one of a handful of people who have turned Hobbs into a potential creative node in the Southwest,” Meow Wolf co-founder and vice president Vince Kadlubek says of the center’s executive director, Andrew Akufo. “With his work, we could be talking about Hobbs along with Marfa and Silver City.” It’s a mission that Kadlubek sees as perfectly aligned with that of Meow Wolf, so much so that the organizations have collaborated on several arts education projects. When Akufo moved to Hobbs to take the job in 2013, the center was having trouble connecting with locals, let alone the larger arts community. “It was known as the place that always had its door closed and its lights turned off,” Akufo says. “There were people who’d lived in Hobbs their whole life and didn’t know it existed.” As the center’s only full-time employee, he has rallied Lea County around an array of top-tier multicultural arts programs—and fostered high-profile partnerships across the region. At this rate, Hobbs seems bound to plant a new flag on New Mexico’s art map. “When I came to town, I traveled through West Texas,” Akufo says. “I was driving through these little towns, and the only thing that was going through my mind was: I hope Hobbs does not look like this.” In his hometown of Oklahoma City, he’d built a reputation as a painter (see his work at nmmag.us/akufo) and organized successful shows at an artists’ cooperative. It was a big move, but Akufo’s nerves were quelled when he reached Hobbs. “I saw traffic lights and the big football stadium and I said, Oh, yes, civilization. I can work with this.” At the time, the arts commission board was determined to inject the headquarters with fresh energy. 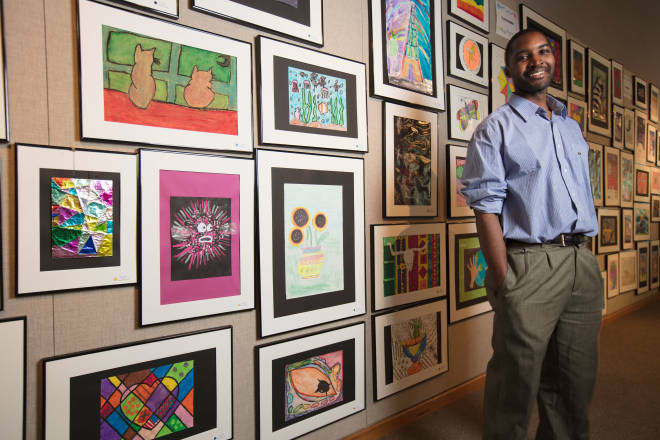 Board president Tyson Ledgerwood, who also oversees elementary school arts programs in Hobbs, envisioned Akufo—an outsider with a background in the arts and a host of innovative ideas—as the center’s missing piece. “I had a lot to prove,” Akufo says. He didn’t waste time, leveraging an off-campus work-study program from the Hobbs branch of the University of the Southwest, a Christian college, to build a team of part-time student co-workers. They helped him revitalize the center’s after-school program, summer art camps, and teen mural project. Then he worked to kick-start a bold new series of visual exhibitions and performances. “A lot of things started falling into place,” says Akufo. “I get a lot of credit, but for the most part I’m just a connector. I’m connecting people to the right opportunity.” Akufo’s first major project was the center’s Black History Month celebration in 2013. He curated an exhibition of African American artists and organized a performance featuring internationally renowned gospel singers. Akufo’s knack for channeling waves of creative energy has influenced other corners of Hobbs and Lea County. He collaborated with Ledgerwood and the Hobbs Municipal School District on a series of elementary school programs, bringing in Albuquerque’s National Institute of Flamenco, Santa Fe’s Wise Fool New Mexico, EmiArteFlamenco, and Currents New Media, and award-winning Oklahoma muralist Bob Palmer. “Andrew is a role model for other young leaders who strive not just to sit and blog about the world’s problems, but get up every morning and work towards the greater good,” Ledgerwood says. One of their biggest accomplishments—so far—was securing a 21st Century Community Learning Centers grant for the Hobbs schools, which provides $1 million a year for innovative educational efforts. That’s how they were able to bring Meow Wolf artists to Hobbs to lead a series of classes in the schools. The grant also allowed Hobbs students to visit Meow Wolf’s House of Eternal Return art installation, in Santa Fe, with free admission provided by Kadlubek.